If there were ever a stronger Act 2 in life, or a more identifiable modern writer’s voice than Anthony Bourdain’s, well, I’m still looking. Witty, decisive and incisive, his observations about food and culture rang true. And, we are a lesser world with his passing. I remember having quite a few business meals at Les Halles before he became famous. Had he himself cooked them? I remember the lyrical prose in his New Yorker essay and guffawing while reading Kitchen Confidential. I still remember watching his first TV show, and, since then, I’ve watched them all, sometimes more than once, from the Food Network to the Travel Channel to CNN. I long have followed him on Twitter, growing concerned at the amount of alcohol he was consuming at one point. I was glad that he was enjoying parenting and seemingly at peace with his peripatetic life. There were, I am convinced, multiple Tony Bourdains, from the convivial to the snarky to the pensive to the downright dark. And, yet, all throughout, he projected authenticity, he was his then-self. He was a person with whom you’d grab a beer at any time, knowing full well you better contribute to the conversation with insights and wit. He was a person who would order tripe, durian and nattō, both to enjoy them himself and to watch how you’d react. He was the kind of person who knew that uni is a sea urchin’s gonads. And, that it tasted of sublime goodness, particularly if from Hokkaido. Bourdain knew much, but, yet, he was kind and drew attention to refugees, the marginalized and the countless underpaid kitchen staff, normally from Central America, who prepped and cooked the fanciest meals that they themselves could not afford. If you watched his show, you knew to check at the door your food phobias, narrow palates and Wonder Bread sensibilities. You were going to eat vicariously something new and learn much about the culture that created such a food. You were going to see that “the locals” are, in the end, human and not to be feared or denigrated. 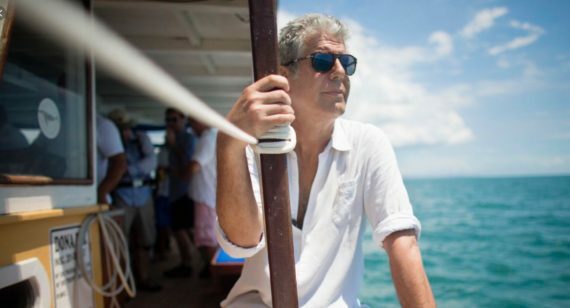 To me, Bourdain was not a writer or TV show host. He was an anthropologist, The Jane Goodall of Food, who bridged together two groups. Though I never met him, I feel like I almost know him. He has been a food guide for two decades for me. 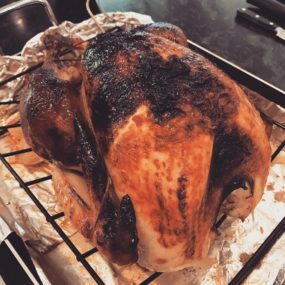 I am cooking turkey for a crowd today, as we are part of a Summer Friendsgiving potluck. I do so while thinking of Bourdain and his family with the hope, no, with the fervent desire, that time does heal all wounds, including his. Thank you, Chef, for the many gifts you gave to so many! May you be at a roadside food stall, where the beer is ice-cold and the bún chả is limitless, a joyful dinner with people you love, and who love you, a meal that lasts forever.